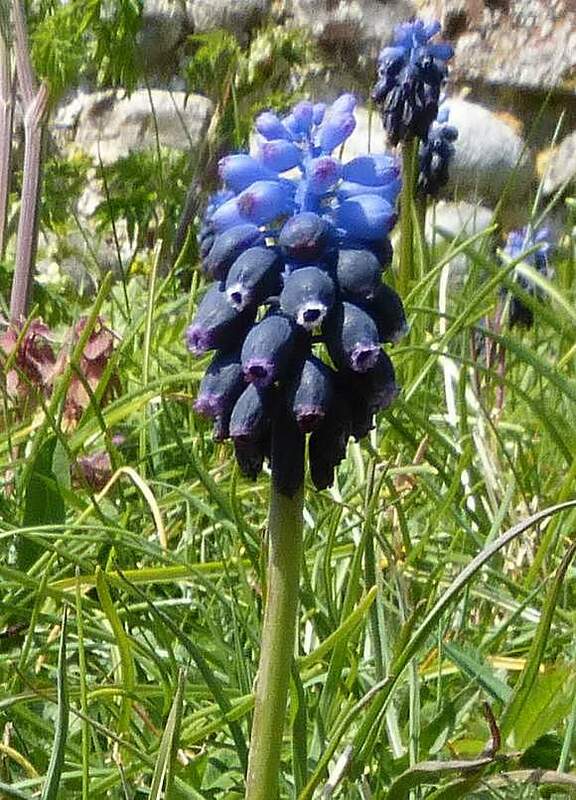 A perennial plant which grows from an underground bulb. 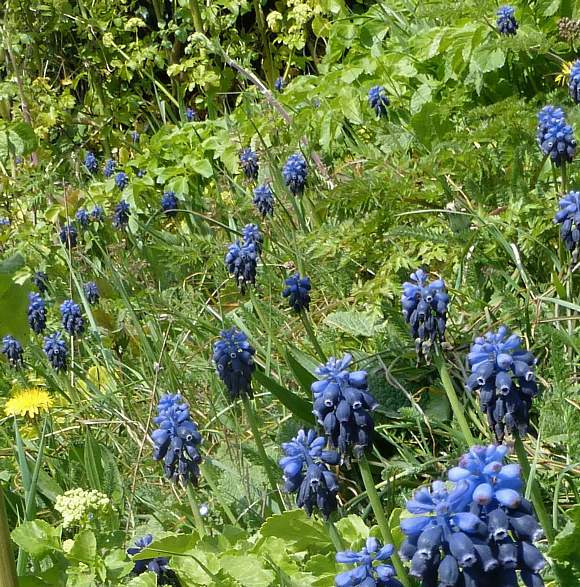 It is the only native Grape-hyacinth; the 3 others are introduced and naturalised. It can spread, as here. It grows to 30cm high, with a dense inflorescence in a spike near the top. The topmost flowers are sky-blue and infertile. 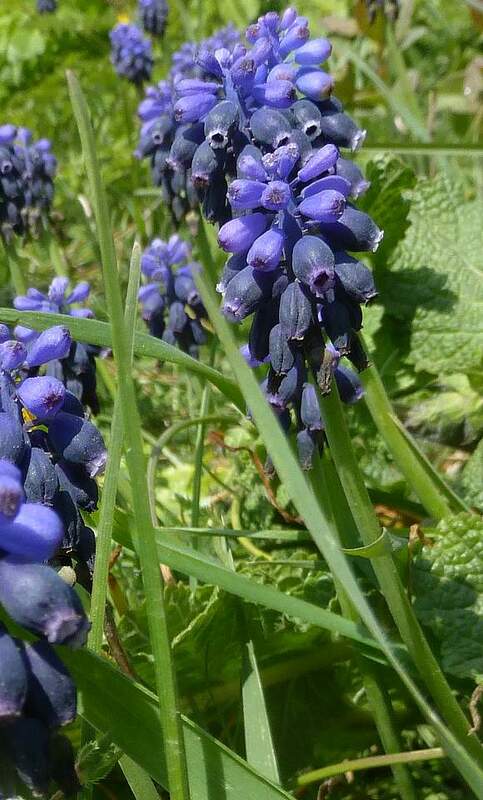 The individual flowers are said to be shaped and coloured like grapes, hence the common name Grape-hyacinth. The flower spike is in a dense raceme between 1.5 to 5cm long. The fertile flowers are between 3.5 to 7.5mm long and 1.5 to 3.5mm wide. 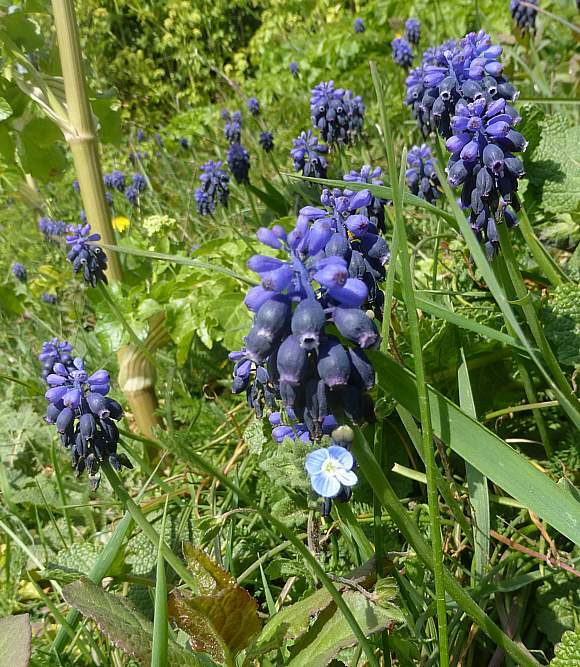 The dark-blue flowers are the largest and are fertile; whereas the sky-blue ones are smaller and infertile and the first to wither and shrivel (leftmost flower spike). Unlike hyacinths, the flowers are ovoidal and only splay out into 6 very-short 'petals' (actually tepals) right at the end. The flowers droop downwards obscuring their stamens and style. The small opening at the end of the flower is white to lilac in colour and consists of 6 curled-back very short tepals. Each flower is on a short petiole (stalk) which has a minute bract near the stem (best seen amidst the smaller infertile flowers ate the top). 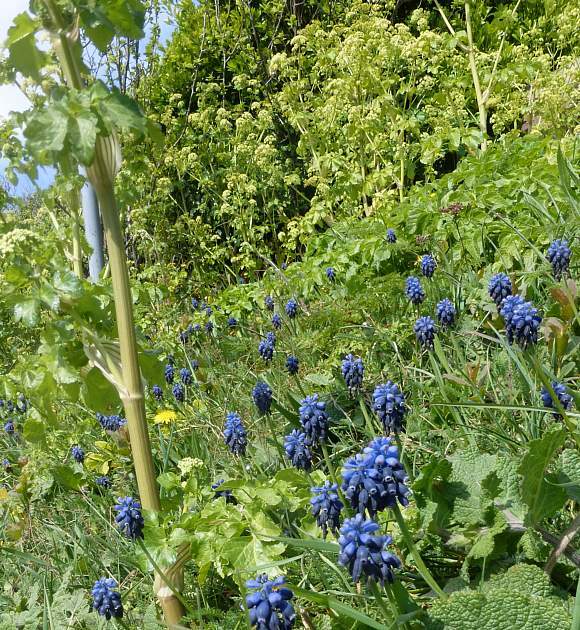 Compact Grape-hyacinth (Muscari botryoides) Slightly shorter stems to 25cm with leaves up to 20cm long but conspicuously broadening at the tip. The racemes are densely populated and between 1cm to 6cm long. The lower fertile flowers are 2.5 - 5mm long and 2.5-4mm wide, bright-blue (rather than deep dull-blue) but the 6 lobes are white. It is a persistent garden plantwhich spreads where tossed out. 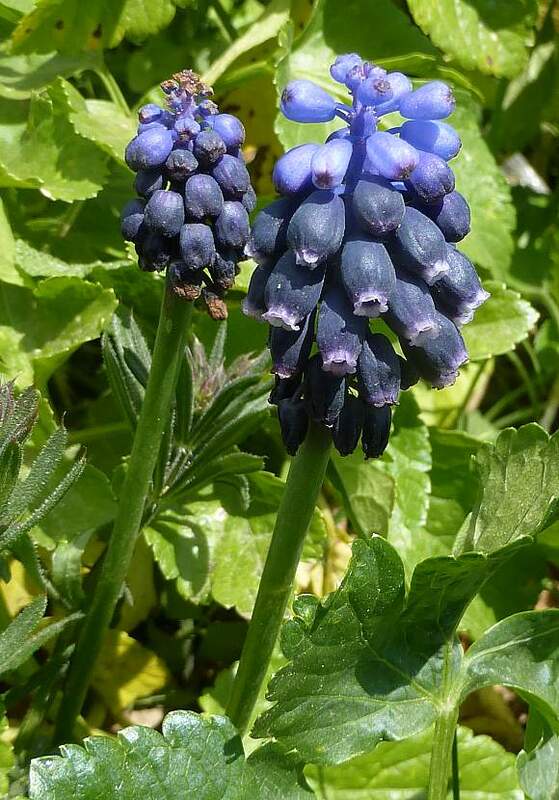 Tassel Hyacinth (Muscari comosum) which is up to 60cm high with a much longer flower spike which is much more open with the flowers on much longer petioles (stalks). 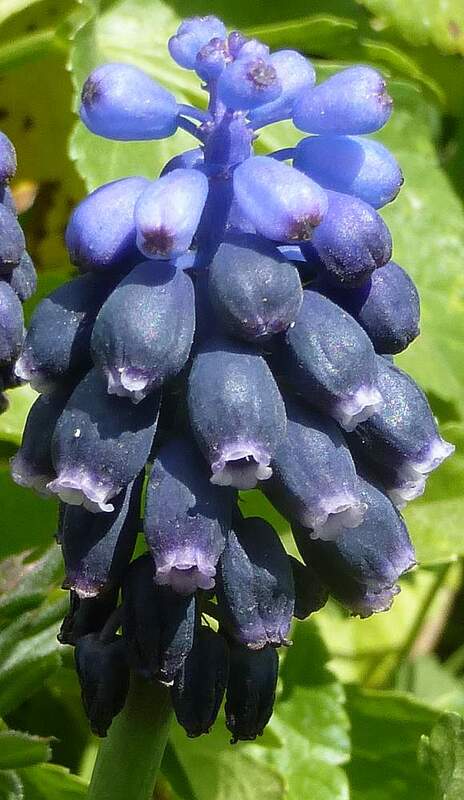 Moreover, the upper flowers [sterile] are bright blue-purple whilst the lower [fertile] flowers turn dark straw-coloured, grow longer petioles and longer flowers and droop down under their own increased size and weight, like a tassel. The fertile flowers are 5-10mm long and 3-5mm wide. It's leaves are also much longer (40cm) and wider (2cm). 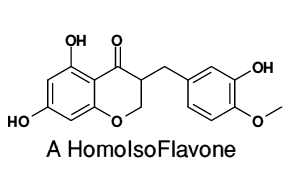 Muscari neglectum is toxic and contains a spread of HomoIsoflavones (30, 62, 80, 104-107) in the bulbs as well as a Scillascillin-type HomoIsoFlavone which has an unusual oxygenation pattern in the B-ring (55). 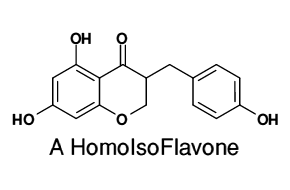 HomoIsoFlavones contain a Chroman-4-one structure (the two fused 6-membered rings on the left, one unsaturated, the one on the right saturated and with an =O side-group attached at the top). These first four are not that different to the next three: just draw an extra bond on the lower three between the same point on the chromen-4-one as where the bridge across to the rightmost moiety joins to the point on the benzene moiety on the right below that where the bridge joins that. 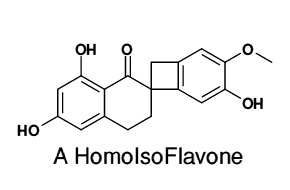 When you have done that, you will get the same 4-membered ring (a cycloButane ring) as the top 4 molecules. 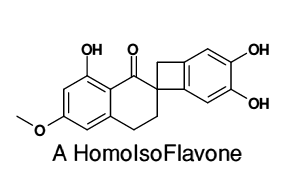 Your Author regrets that he does not know the names of these compounds. 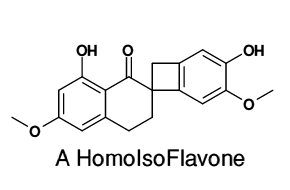 Even the suffix is not a part of its name (it is just a number in a research paper showing which plant produces which compound). 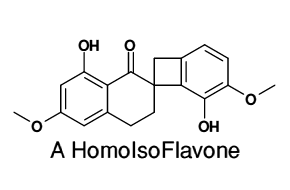 Three more HomoIsoFlavones based upon chromen-4-one. 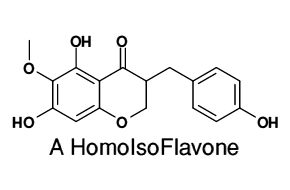 There are a great many other HomoIsoFlavonoids fiffering only in their side-groups which are to be found in almost all genera of the Asparagaceae family, but these are the 7 reported to be in Grape-Hyacinth (Muscari neglectum) species. See Glory-in-the-Snow for some others.